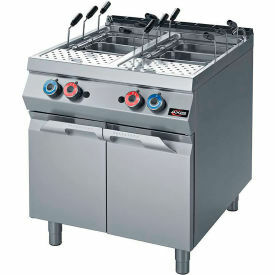 This Gas Pasta Cooker is among the kitchen's most reliable and trusted equipment. Chefs world-wide use it to cook fresh or dry pasta, as well as rice, vegetables, potatoes, and seafoods or just to rethermalize. This self-contained cooking system eliminates the dangerous handling of heavy pots containing boiling water. As an option, solid pans can be inserted into the cooking chamber to hold sauces.